There is no experience that can compare to zooming high above the forest canopy on a high-tension steel cable at a velocity that surpasses thirty miles per hour. 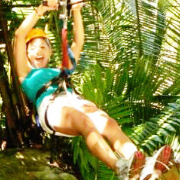 Whether you’re an extreme sports enthusiast, or looking for the exhilarating excitement of a theme park ride, or would like to enjoy a one-of-a-kind view of the jungles outside of Puerto Vallarta, our Canopy Zipline Adventures are for you. Zip-lining is pure pulse-pounding pleasure. No matter which zip-line adventure you select, you will enjoy some great high-flying action on various fun-filled zip-line cables. 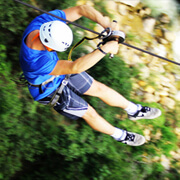 Our courses also include other elevated activities on climbing towers, rappelling lines, sweeping vine swings, and dizzying suspension bridges. You can even glide through the treetops in the film shooting locale of the Hollywood blockbuster, Predator. This science fiction action flick starred Arnold Schwarzenegger, Carl Weathers, and Jesse “the Body” Ventura. You may recognize the lush jungle scenery featured in this popular movie. 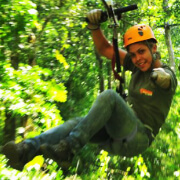 Some of our zipline tours are combined with other outdoor tours like hiking or mountain biking, so that you can enjoy the full experience of exploring this verdant forest landscape. The wilderness of this region is full of beautiful flowering plants, including delicate orchids. 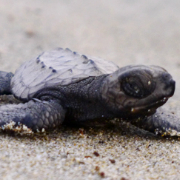 There are more than two hundred bird species that inhabit this beautiful habitat. Colorful songbirds will serenade you as you soar through the air. 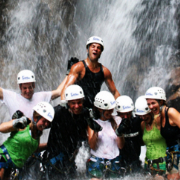 Even if you are afraid of heights, you will feel confident in the hands of our expertly-trained adventure guides who will ensure that all of our equipment is meticulously inspected and maintained and that every proper safety precaution is taken. 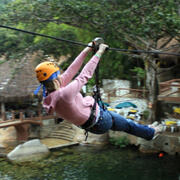 You'll rocket through the bright green jungle canopy high over the rushing waters of the Mismaloya River on an exhilarating zip-line expedition. This tour of the shooting location of the movie Predator merges the excitement of extreme sports with the natural beauty of an outdoor excursion. While on vacation in the lovely vacation retreat of Puerto Vallarta, do not miss this rare opportunity to swim with some of the most interesting animals to swim in the world�s oceans: the dolphins. Join our veteran animal trainers at our Nuevo Vallarta marine mammal facility to swim with Bottlenose Dolphins.